Pastel, attributed to James Sharples, Sr. (c. 1795); Independence National Historical Park. John Langdon, who represented New Hampshire at the Constitutional Convention, was a wealthy international trader. Thrust by his widespread commercial interests into the forefront of the Patriot cause, Langdon contributed his highly developed business acumen during the Revolution to the problems of supplying the Continental Navy. As a citizen-soldier, he also participated under arms in the American victory, on several occasions using his personal fortune to ensure the success of his militia command. Langdon's various political and military experiences in the Revolution led him to believe that the well-being of his country demanded a binding union of the states. A citizen of one of the smaller and less influential states, he realized in particular that only a strong central government could ensure that the rights and privileges of all citizens would be equally protected. His business background also convinced him of the need for a government that could guarantee economic stability and growth. At the same time, his experiences in the militia and in the Continental Congress made him an articulate exponent of the idea that a well-regulated militia force, subordinate to civilian authority, was an important ingredient of any new government. During a long political career at both the state and national level, Langdon would continue to extol and explain the unique blending of the advantages and responsibilities bestowed upon the republic by the Constitution. The Langdon family was among the first to settle near the mouth of New Hampshire's Piscataqua River, a settlement which in time became Portsmouth, one of New England's major seaports. The son of a substantial farmer and local politician, John Langdon was educated at a local school run by a veteran of New England's 1745 expedition against the French at Louisbourg, Canada. Langdon and his older brother Woodbury both rejected the opportunity to join in their father's successful agricultural pursuits, succumbing instead to the lure of the thriving port. With the idea of entering the Yankee sea trade, they apprenticed themselves to local merchants. John Langdon did not remain long in the counting house. By the age of twenty-two he was captain of a cargo ship sailing to the West Indies, and four years later he owned his first merchantman. Over time he would acquire a small fleet of vessels, which engaged in the triangular trade between Portsmouth, the Caribbean, and London. His older brother was even more successful in international trade, and by 1770 both young men could be counted among Portsmouth's wealthiest citizens. The brothers entered local politics on the eve of the Revolution. Despite similar educations and business careers, however, they represented opposite ends of Portsmouth's political spectrum. While Woodbury Langdon rapidly rose to become a leader of the conservative merchants, John served on the town committees elected to protest the tax Parliament enacted on the tea trade and to enforce the Continental Association, a boycott of British goods organized throughout the colonies. Illustrating divided political opinion in the colony, both brothers were elected in 1774 to represent Portsmouth in the New Hampshire legislature. But John Langdon soon grew impatient with the political process. He joined a group of militiamen who removed the gunpowder stored at the local fort before it could be seized by the Royal governor. In 1775 New Hampshire selected him and another leader of the gunpowder raid, John Sullivan, to attend the Second Continental Congress. Langdon immediately cast his lot with those calling for independence. Langdon made an important contribution to the war effort during his year in the Continental Congress. In November 1775 he traveled to the northern front as part of a three-man committee to confer with Major General Philip Schuyler on preparations for the coming campaign. He stopped en route to investigate the situation along the Hudson River and approved the organization of the first regiment of Canadian volunteers in the Continental Army. More significantly, Congress, recognizing Langdon's maritime experiences, appointed him to the committee that oversaw the establishment of the Continental Navy. 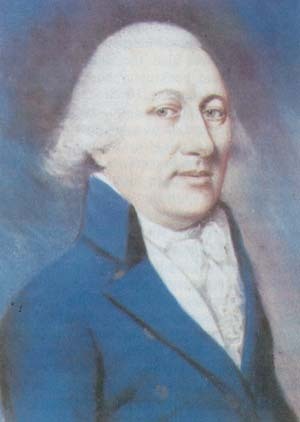 In early 1776 Langdon resigned to accept appointment as the Marine Agent for New Hampshire, the national government's primary official within the state. Employing his local contacts, he established a shipyard in Portsmouth and began work on one of the first Continental frigates, the Raleigh. While he operated his own fleet of privateers, he also supervised construction of the Navy's first major warship, the 74-gun America. The most ambitious shipbuilding project in the country to that time, the America was launched near the end of the war. Another of Langdon's major responsibilities as marine agent involved supervising the importation and distribution of arms. Shipped from France to ports in New England, and especially Portsmouth, these vital weapons were disguised in a complicated trade deal to maintain the appearance of French neutrality. Thanks in part to Langdon's efforts they reached the regiments of the Continental Army in time for the crucial campaigns of 1777. Langdon's efforts as marine agent made it clear to him that the lack of an efficient central administration was an impediment to the success of the war effort. To equip his warships, he had to spend much time persuading the various states to contribute precious resources to projects that did not promise any immediate return. Even the distribution of weapons taxed his diplomatic skills to the utmost, for he had to weigh and assign priorities to the competing claims of the various New England governments, at the risk of losing their vital support for other projects. In 1777 Langdon assumed a more direct role in the defense of the country. Serving as speaker of the lower house of New Hampshire's legislature�a position he would hold for the rest of the war�he devoted much energy to reorganizing the state militia. Under Washington's strategic concept, the citizen-soldiers were expected to provide for local security against sudden raids and to reinforce the Continental Army during specific campaigns. Langdon and his colleagues now formed the New Hampshire militiamen into two brigades. One was based in the east to protect the coast from attack by the Royal Navy and to support the other New England states. A second brigade was organized in the west to guard the frontier against attack from Canada. Langdon himself took command of an elite company of light infantry in General William Whipple's eastern brigade. Langdon's unit, often called a "silk-stocking" outfit by his contemporaries because it was composed of wealthy citizens who all held officer commissions in their own local militia units, was in fact a highly trained combat formation. British strategy for the summer campaign of 1777 called for a major attack to cut New England off from the other states. While the main British army moved out of New York City against Philadelphia, drawing Washington's soldiers south, a second army under Lieutenant General John Burgoyne was to move down from Canada, capture Fort Ticonderoga, and then follow the Hudson River at least as far as Albany. Ticonderoga fell in early July, suddenly exposing the full length of New Hampshire's frontier. The state mobilized its western brigade under Brigadier General John Stark to deal with this emergency. These troops played a major role in the victory at Bennington in August, and then started attacking Burgoyne's lines of communications. By September, Burgoyne's army had been halted near Saratoga, New York, by the combined efforts of continentals and various militias from New York and New England. To help break the stalemate, additional militia units were called up, including Langdon's company. They arrived in time to surround the British, cutting off retreat to Canada. On 17 October 1777 "Gentleman Johnny" Burgoyne and his entire army surrendered. Langdon witnessed this "grand scene' " as he called it, the result of the cooperative efforts of the regulars and the militia of four separate states. He also took considerable satisfaction in the fact that he had paid out of his own pocket for much of the equipment used by his militia company, saying, "If we defend our homes and our firesides, I may get my pay; if we do not defend them, the property will be of no value to me." In 1778 it was the turn of the eastern brigade to be mustered first. General Whipple planned a march to Rhode Island to join in an effort to oust the British from Newport, their last foothold in New England. Langdon's company, reorganized as a cavalry troop, again at its commander's personal expense, volunteered for duty. Whipple's men combined with ' other militia units and a force of continentals for the ambitious campaign. Timing their attack to the arrival of a French fleet off Newport, the Americans crossed from the mainland to the northern end of the island containing the city and began cautiously pushing south. Before Newport could be brought under effective siege, however, the appearance of a Royal Navy squadron and an unexpected storm forced the French to withdraw. Too weak to operate without naval support, the Americans had to retreat. The Rhode Island campaign marked the end of Langdon's active duty. At the conclusion of the war he declined further service in the Continental Congress, but retained his seat in the state legislature. In 1785 he became president of the state, the title New Hampshire bestowed on its governors. Defeated for reelection in 1786, he returned to the legislature. During this period Langdon became increasingly concerned with the financial health of the newly independent nation. As a merchant, he realized that the slide of the states and Congress toward bankruptcy hurt America's international economic standing. He strongly supported the efforts of Washington, Madison, and others who were calling for the creation of a new government. Langdon joined this effort when in 1787 New Hampshire appointed him to represent the state in the Constitutional Convention. In fact, so anxious was he to participate that when the legislature failed to provide funds for its delegation, Langdon personally paid his own way and that of fellow delegate Nicholas Gilman. Langdon and Gilman missed the early sessions of the Convention, but Langdon was soon noted for his strong support of measures to strengthen the national government. As to be expected from one with his wartime experiences, Langdon was particularly forceful in advocating centralized authority for the regulation of commerce, taxation, and military matters. Following the Convention, Langdon served briefly in the Continental Congress, returning to New Hampshire later in the year to participate in the states ratification convention. In these meetings Langdon exercised his considerable political skills, devising the strategy that ultimately won the states approval. Although many feared the new instrument of government would be rejected nationally, New Hampshire's ratification, as the ninth state to do so, put the Constitution into effect. Langdon went on to serve another term as governor before resigning in 1789 to become one of the first United States senators. He presided over the Senates first session in which the electoral, votes that made George Washington President were counted. Initially, Langdon supported Hamilton's economic policies, but over the years he grew disenchanted with the Federalists, becoming one of New England's earliest supporters of the political party forming around Thomas Jefferson. Retiring from the Senate in 1801, Langdon rejected Jefferson's offer to become Secretary of the Navy. Instead he returned to his business interests in New Hampshire and further service as legislator and as governor, retiring finally in 1812. Throughout his long political career, Langdon had espoused a simple philosophy of government: The people must grant government sufficient authority to promote their interests, but must impose sufficient controls to protect their liberties. He lived to see these ideas perpetuated in a living Constitution.